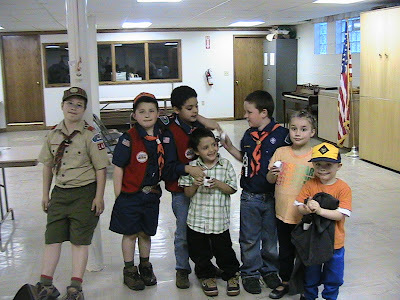 Cub Scouts again :) We had our den meeting on Wednesday evening, and the boys all had lots of fun. We started out playing a "build a bug" game. The goal was to get a complete drawing of an ant. Boys rolled the dice, and each number corresponded to a part of an ant. They needed 1 head, 1 body, 1 thorax, 6 legs, 2 feeler, and 2 eyes to win. It was pretty fun. Next time, we need more dice! 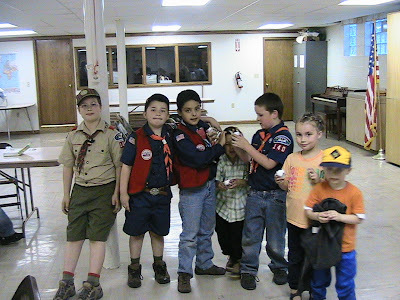 Then, Jacob went with Brent for Webelos, and they worked with Sculpey. Everyone else stayed with me, and we made Egg Heads. We took eggs, cracked off 1/3, washed them out, filled them with soil, put grass seed in the top, topped off with dirt, glued on squiggly eyes. Then, when the boys get home, they can water their little guys. In a few days, they should have hair, and need a cut. Pretty fun. Then, we sat down and rolled a ball around and played "name that bug" and "Hot Potato" bug style. Pretty fun times :) After, we had dessert. Dirt. Take 3 pks of chocolate instant pudding, prepare. Add 1 tub of cool whip. Split between 13 styrofoam cups. Crush chocolate sandwich cookies. Top the pudding with cookies. Insert a gummy worm. Serve. The kids really thought it was neat! And tasty. Here's a picture of all the kids just before we all went home. Aren't Cub Scouts fun!